March 18, 2019 – I couldn’t have asked for a more perfect day to ride and write on the M.V. Tillikum. Sunshine, snow-covered Koma Kulshan (Mt. Baker), and water the shade that always comes to mind when I hear the word sea greeted me as I watched the M.V. Yakima sail for Anacortes. 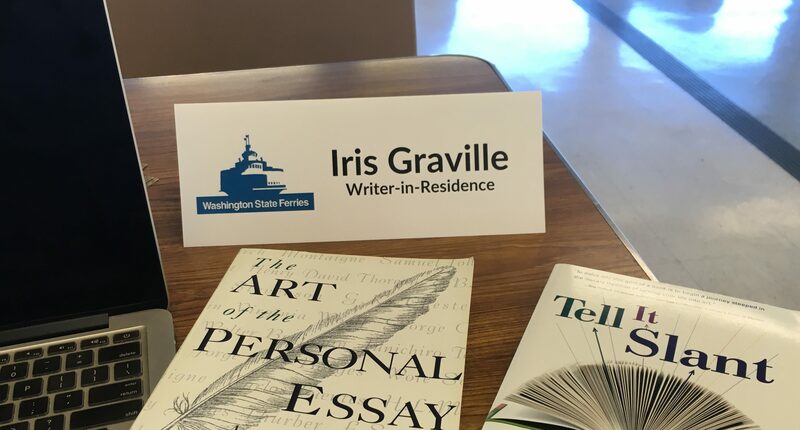 The Tillikum (“the interisland”) was close behind, and I boarded along with fellow writer, Kathleen Grimbley. What I didn’t know until the next morning was there was some good news about the Southern Resident Killer Whales (orcas) that call the Salish Sea home. MyNorthwest.com reported the newest orca calf (L124, or “Lucky”) was seen by the Center for Whale Research on March 9, along with other whales from L pod, “zig-zagging their way toward Obstruction Pass,” near Washington State’s Orcas Island. As far as I know, this was the first sighting of Lucky since the film below on January 11. Researchers estimate Lucky was born in late December 2018. In recent years, the majority of orca calves haven’t survived the first year of life, and since a calf’s death last summer just thirty minutes after birth, this recent addition to L pod offers a glimmer of hope. It will take much more than hope and “luck” to preserve these endangered whales, though. This week, Friends of the San Juans, a preservation organization, is urging us to “Protect What You Love,” at a series of educational presentations. I attended today’s session on Lopez Island, and I came away with homework. I have some postcards to write to my state senator and representatives, urging them to support bills to decrease risks to orcas: decreased food supply, noise, and toxic waste. If you live in Washington and share my concern for orcas (in fact, all life in the Salish Sea), please ask your elected officials to support these bills. And no matter where you live, send good thoughts to Lucky. This entry was posted in Salish Sea, Southern Resident Killer Whales. Tagged Center for Whale Research, Friends of the San Juans, Lucky, Orca whales, Salish Sea, Tillikum, writing. Iris, I’m getting an error when I click on your link for Koma Kulshan. I’m always interested in the pre-settler names for our landmarks and special places; I’d like very much to read that if the link is fixable. You’re welcome, Carole. Thanks for reading.